Two Episcopal seminaries: Virginia Theological Seminary (VTS) and General Theological Seminary (GTS), today announced the creation of an exciting innovative joint project focused on the future of the church. When asked about the importance of this conference, Stace responded, “Religious institutions have an opportunity to save lives.” She went on to cite several studies that indicated the significant decrease of depression and suicide rates among transgender people and discovering a genuinely affirming religious community. It is a reminder that we are people of Christ, not of architecture. Our God transcends the walls we have built, our faith is too big to be gated in. There will always be a place for soaring church towers, but there is also a place for the living room, the gym, the food truck, and the street corner. Artist and Spiritual Director Heather K. Sisk received her M.A. in Spiritual Direction from General in 2010 and has returned as a Middler M.Div. candidate. 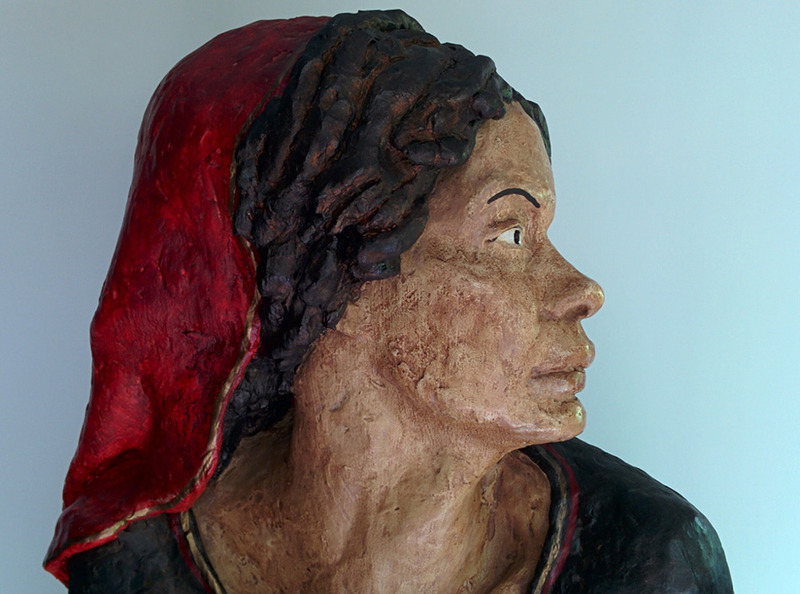 Her original sculptures on the theme of Mary Magdalene as spiritual guide, first exhibited at General in 2012, are now on display in the lobby of the Christoph Keller, Jr. Library. This project is based on the subject of Sisk’s Masters Thesis and was funded in part through a grant awarded by the Episcopal Evangelism Society in 2010. These pieces act as three dimensional icons to accompany a retreat based on The Magdalene as role model for a spiritual journey which is accessible to all of us. The retreat has traveled since 2012. Sturdy shoes, for the twelve apostles and for new seminarians alike, are necessary gear. Sturdy shoes help us keep walking when we want to quit and go home. The story of Mary and Martha always leaves me a bit defensive. Feels like Martha gets a bad rap. After all, she’s the one who is doing all the things: inviting, planning, purchasing, cleaning, cooking, greeting at the door, serving, and cleaning up again. The elderly woman in the hospital bed motioned toward the television and said, “No, don’t pray for me, pray for those children. Pray that they are reunited with their families.” This lady, who had fled the Soviet Union in the 1990s, understood what it meant to leave country and family behind. It’s a perfectly reasonable question and I hear it all the time from friends and colleagues whom I haven’t seen for a while. When I signed the big book at Matriculation in the fall of 2002 as a member of the Junior MDiv class, I had three children under five: identical twin four-year-old boys and an infant son. Taking a Night Out? Remember to Use The Arts Fund! The Gwendolyn Simmons Arts Fund at The General Theological Seminary was established for the purpose of encouraging students to take advantage of the many cultural opportunities available to them in New York City by providing a financial subsidy for attendance. · Each full-time student may submit one ticket each academic semester from a cultural activity, including theatre, ballet, opera, and art galleries (sports activities are not included). They will be reimbursed one-half the cost, up to $50.00 per ticket. · Students may also submit one ticket stub each academic semester for their spouse, for which they will be reimbursed one-half the cost, up to $50.00. The stubs must be submitted in the term in which the student attended the event. · Ticket costs for children, friends, and other family members are not covered by The Arts Fund and are totally at the student‘s expense. · The Arts Fund is administered by the Advancement Office. Bring your ticket stub(s) to Jonathan Silver or A.J. Flagiello (Seabury 202/203) for submission to the business office for reimbursement. The Arts Fund reimbursement program was made possible through the generosity of the late Joseph A. Davenport III, a former trustee and longtime friend of both the Seminary and the Arts. Davenport named the fund in honor of the late Gwendolyn Simmons, with whom he served on the Board. Simmons was a greatly respected teacher, leader of the Church, and lover of the arts. She was a member of the Bishop’s Standing Committee of the Episcopal Diocese of New York, receiving the first-ever Servant of Education Award from the organization. Both Davenport and Simmons were recipients of General’s distinguished Clement Clarke Moore Award. In memory of the great faith, support, and presence of these two leaders in our community, please take advantage of the Arts Fund to experience the grace of culture in New York City.